ICS-based slate supports 3G USB dongles; comes preloaded with educational courseware, e-books, and 3 Idiots HD movie. Android 4.0.3 (ICS), supports Google Play store, Customized Flick to Life 2.0 UI. 1.2 GHz Cortex-A8 CPU, 512 MB of RAM. 7" TFT LCD with capacitive multi-touch screen (800x480). 4 GB internal storage, 32 GB microSD slot. VGA front camera, Wi-Fi inbuilt. 3G \ EVDO USB dongle support, compatible with the following: Airtel 3G E1731, Idea 3G E1732, Reliance 3G MF190, Reliance Netconnect+ EC150, MTS MBlaze AC2746, Tata Photon+ EC156, Tata Photon+ EC1261, Lava 730G (requires downloading the latest tablet software update). Full HD (1080p) playback capable, Micro-USB port, 3.5 mm headphone jack, gyroscope. 2800 mAh battery with estimated browsing time of 5 hours. 8" (l) x 4.8" (w) x 0.5" (11.9 mm) (h); 350 grammes. Package contents: Tablet, Battery, Charger, Data Cable, Headset, OTG cable, Warranty card. Lava claims to have customized the UI with its proprietary Flick interface, as well as a bundled FUSION app that provides access to the latest online music and videos, as well as categorizing your local tracks in a interface inspired by the iOS's Cover Flow. It also comes with a bunch of preloaded social networking, chat clients, office tools, and casual games. 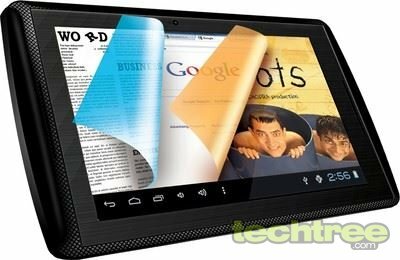 The Lava eTab Z7H is available at a street price of Rs 5500 on Flipkart.com, but seems to be out of stock as of this writing. The package includes a few bundled offers, as listed below. For high-res images of the tablet, view the gallery at the bottom. Tata Photon+ dongle for Rs 750, includes 6 GB of free data for a month and a "100% money back" scheme. HD version of the Bollywood flick 3 Idiots, along with 10 more HD videos, all preloaded on the tablet. Furthermore, customers are allowed a free download of 50 items in three months, as well as free streaming of six movies for a month from Hungama.com, which represents a value of Rs 1250. This offer is valid till 31st Jan 2013. 14 e-books have been stored in the tablet, in association with Tata McGraw-Hill. The titles include Dr APJ Abdul Kalam’s Envisioning an Empowered Nation, Word Power, and Dhirubhai Ambani’s biography. A free one-year subscription to the Vedic Maths module on Meritnation.com is available, as well as a discount voucher of Rs 750 for purchases from the website.